Angels. This is what many are calling them. 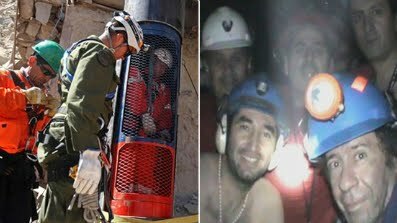 The rescue workers struggling to lift up the 33 miners trapped underground in Chile, are being viewed as nothing short of wonderful farishtaas. And, rightly, so. They have just brightened what was a faint glimmer of hope, for all the families of the miners. For nearly two months now, since the cave-in occurred, and since the world discovered that all 33 miners were safe, but utterly trapped, there were continuous prayers at the mouth of the mine. Families waited and watched with helpless grief, as rescuers worked in a race against time. So, after 66 days, when the drill finally broke through to reach them, it is no wonder that the Chileans, as a nation, are celebrating with dancing and singing; with tears of hope and relief. The miners’ survival for 66 days is itself an amazing feat, thanks to the small bore hole through which food and water was being passed on to them, and communication was maintained. Interestingly, one of the miners, Ticona, even saw the birth of his child on a video sent down that small hole! Two weeks ago, I saw in the TIME magazine, the pictures of these miners and the scribbled drawings they sent up to the rescuers, explaining where they are trapped, and how they can be reached. I had shown these pictures, and was telling my daughters, how difficult it could be to rescue them. Called as the world’s most complex mining rescue mission yet, this will be viewed with awe and wonder. One by one, as the miners are pulled up through a hole, not wider than a man’s shoulders - with the help of a cage-capsule called phoenix - it would be a daring and daunting test of minds and nerves. Only on Wednesday will the actual rescue begin. But to have successfully drilled a 2,050 foot-long (625-metre) shaft over these 50 days or so, is itself, an act of astounding engineering marvel. The depth is somewhat equal to putting the two towers of Bahrain Financial Harbour one atop another and also National Bank of Bahrain Building on top of them (each BFH tower is 260 m tall, and NBB Building is 140m). That gives an estimate of the depth. But more than the depth of the physical hole that has been drilled, it is the strength of collective human endeavour to reach out to fellow humans, which should make us grasp the import of sensitivity, to others, in times of trouble. To prevent accidental caving-in or collapsing, the walls of this drilled passage way, I heard, are being reinforced. And, around the world too, our faith in human beings is being reinforced. Oh, what a fulfilment it is for the heart to know that, even if the task seems insurmountable, we as humans can rise up to great heights – or in this case, go down to great depths - in the honourable service of fellow humans. So, much so, that humans are called Angels. Very thought-provoking post, Joel...and quite nicely articulated! Keep it up!! Hey Lisha. Thank you for the encouragement. I just felt like saying it aloud.